Attempting to head the ball and colliding or falling is by far the #1 risk of concussions in youth soccer, causing more than 30,000 concussions each year. Heading accounts for nearly 1/3 of concussions in youth soccer. Safer Soccer has widespread support among U.S. Soccer legends, who believe that this safety measure will also create more skilled players. Click here to read all the facts in the Safer Soccer White Paper. Click Here to read all the facts in the Safer Soccer White Paper. LSA Policy 213 - Youth Player Safety Initiatives describes how and when a player suspected of having suffered a concussion may be permitted to return to play. Coaches, parents and the players themselves are expected to become familiar with the dangers and symptoms of a concussion and to adhere to the policies, procedures and protocol established by Policy 213. Referees shall be familiar with the requirements of the Policy and shall strictly adhere to them. No one shall attempt to circumvent these procedures or protocol and no one shall attempt to encourage or influence a referee to do so either. If a qualified heath care provider (HCP) is present at the game, any player who sustains a significant blow to the head or body, who complains about or is exhibiting symptoms consistent with having suffered a concussion or is otherwise suspected of having sustained a concussion, must be evaluated by the HCP. 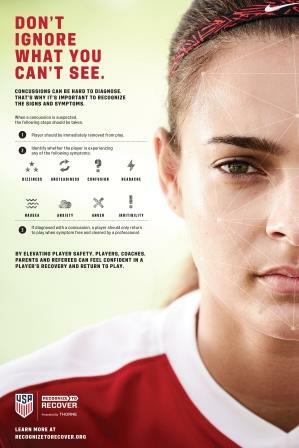 Unless, after proper evaluation, the HCP determines that the player has not suffered a concussion and personally informs the center referee, the player will not be permitted to return to play until the player has successfully completed the graduated RTP protocol described below and has been cleared to play in writing by a physician. f. A licensed physician unrelated to the player must confirm in writing to the club that the player is approved to return to play. In conjunction with the US Soccer Recognize To Recover Program and in the hope of curtailing concussive injuries at the youngest age group, Policy 213.5 establishes a ban on heading the ball. No player 10 years old or younger shall be permitted to head the ball in games or in training. Players participating in any U12 program and younger shall not engage in heading, either in practices or in games. In the event a player, in the discretion of the referee, intentionally heads the ball in a game at the U12 level of competition or younger, the referee shall immediately stop play and award the opposing team an indirect free kick.